View of buttresses on SW elevation. Postcard view of Lessendrum country house, Aberdeenshire, from NW. Lessendrum House, 1837, Archibald Simpson. 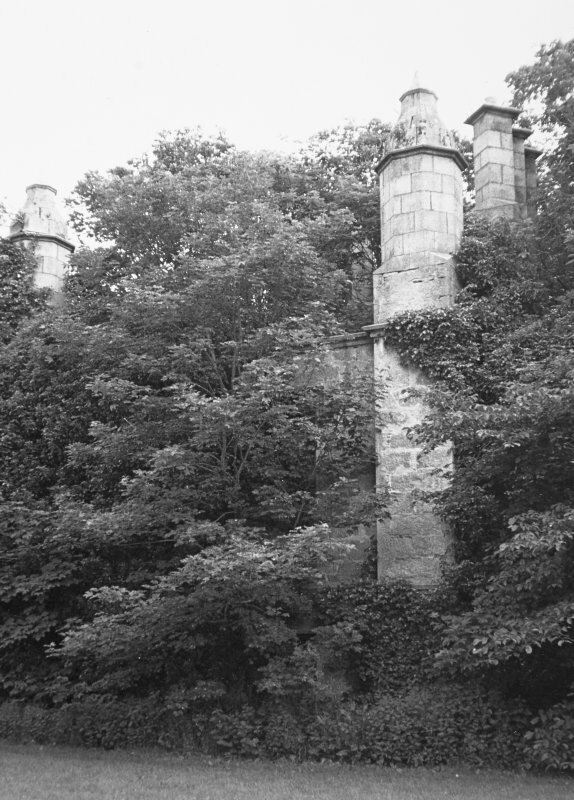 Although now given up almost entirely to the ivy, the few diagonal chimneystacks that rise out of the remains of the 1928 fire, point to the vigour and wit of Simpson's 'pocket Gothic ruin'. 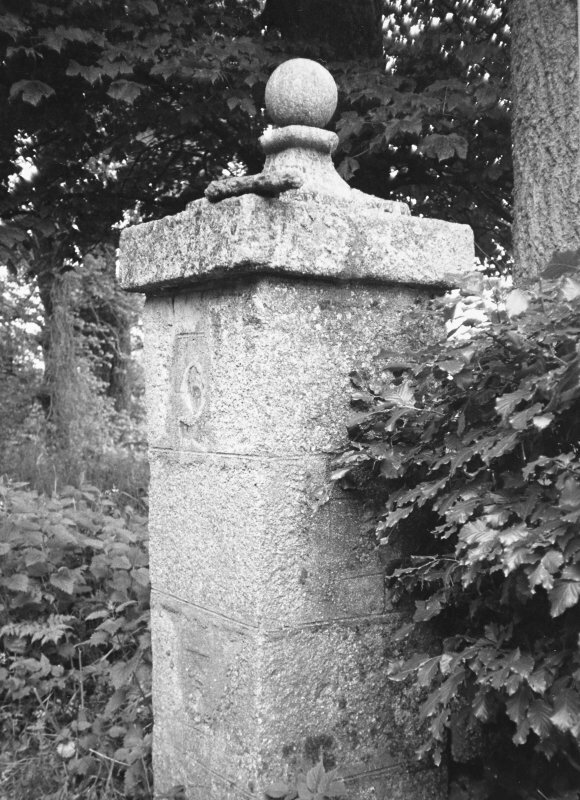 Remodelling a 17th-century house for the Bissets, the 'oldest established line in all Aberdeenshire' with Norman roots, Simpson showed considerable freedom in providing a richly fenestrated two-storey house with a wealth of turrets, one ogeecapped like Newe. Circular doocot with two rat courses; 18th or early 19th century. 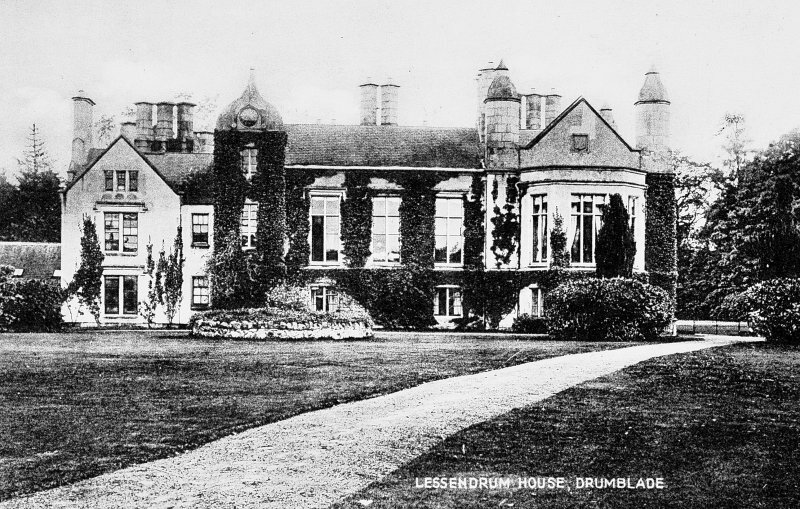 Lessendrum: a mansion which dates as far back as 1470 but was enlarged in 1816 and in 1836. Lessendurm is now a ruin, although the walls still stand to roof-level. Visited by OS (EGC) 2 October 1961. 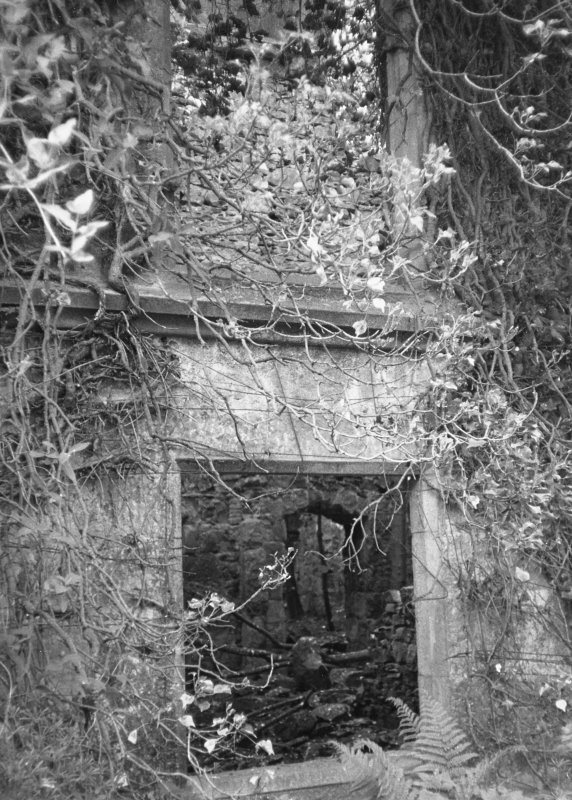 The roofless ruin of Lessendrum House stands within extensive, heavily-wooded grounds. The building comprises an earlier house, probably dating from the 17th century, to which additions were made in 1837 by Archibald Simpson. The earlier house, a two-storey structure, was L-shaped on plan and provided a core for the later additions made to the NW side. Architectural features of 17th century date include the fireplace surrounds in the NW wing of the earlier house and a roll-moulding in re-use in the NW wall. 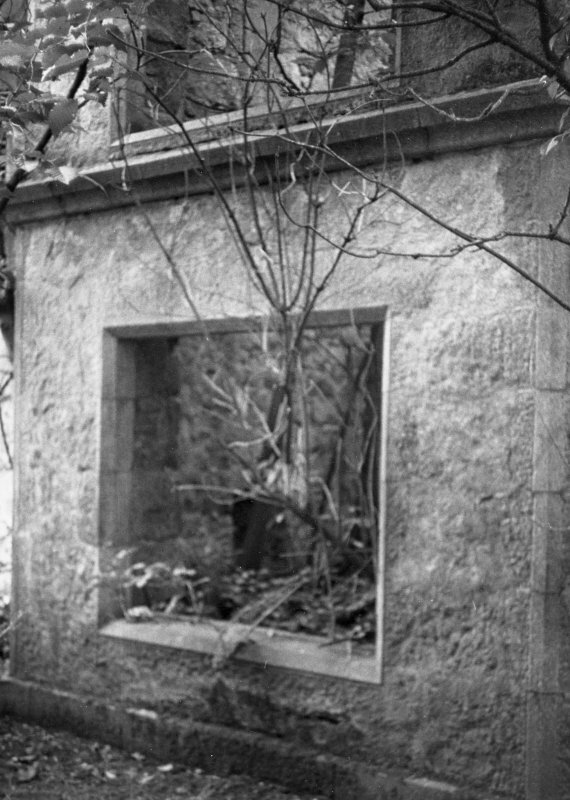 The later house was burnt out about 1921. Visited by RCAHMS (IS) 9 November 1983. Owner: John Moredaunt Murray Bisset. 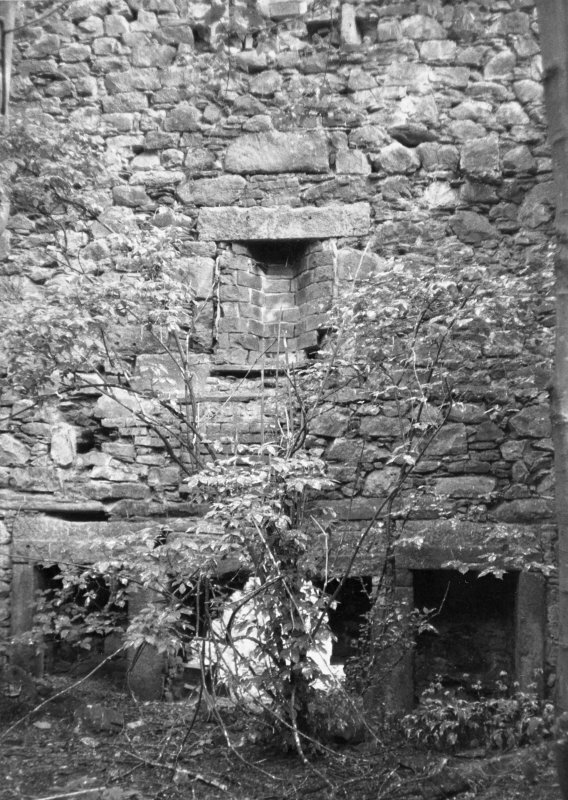 House destroyed by fire 1920's (Source - Aberdeenshire 3rd Statistical Account, published 1960). Asymmetrical house in a Jacobean style, incorporating 17th century fabric but enlarged in both 1816 and 1837. The earlier L-plan house provided a core for Archibald Simpson's 1837 additions to the north west side. 17th century roll-moulding has been reused in the walling of this section. The first floor piano nobile is counterbalanced by the remodelled roofline, with a 3 storey tower to the left (once ogee-capped) and slender pinnacles framing a canted bay to the outer right. Tall diagonal-shafted chinmeys once sat above.